A long, long time ago, Anthony Bourdain was an average chef with a potpourri of substance abuse problems and a novel he was trying to sell. Then, more than a decade ago, he emerged as a nonfiction writer, a very good one, who made being an average chef sound like one of the world’s most fascinating endeavors. Next week, his show No Reservations, on since 2005, will air its last episode. It marks not an end to his career as food personality, but a next step in his move toward ubiquity. Bourdain has, just to name a few projects he’s got lined up, an ABC reality TV show he’s doing with Nigella Lawson, a travel show on CNN, a program on David Chang for PBS, his continued work on HBO’s Treme, and his own publishing imprint for Ecco. The food world is hardly lacking for celebrities these days, but Bourdain has managed to carve out a particular role for himself and his omnivorous, swaggering sensibility. Whether it’s because he changed the way we eat or because he eats in a way that fits with a changed culture, the easiest job description to attach to Bourdain, these days, is the man with the most admired tongue in America: for the tasting, the talking, and the lashing it does. The Bourdain brand has been described as “a persona that's designed — some would say consciously — to stir the pot”; a “persona [that] is all about the uninterrupted projection of cool,” and one that “forsakes gentleness for machismo, balance for bluster. 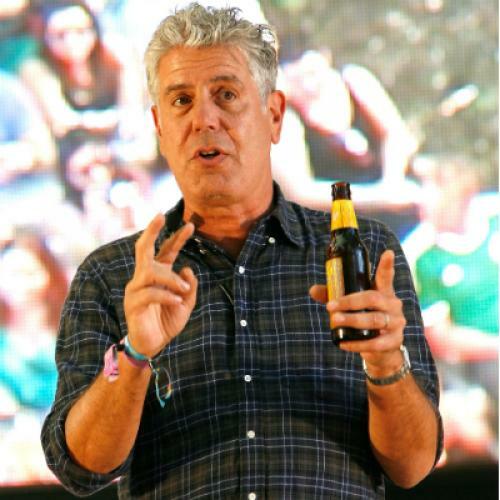 He has spawned an ethic, in the kitchen and in life, that poses as brave, but is really nothing more than the emotional equivalent of a keg stand, or maybe just a fear of being plain.” For the uninitiated: this, more or less, means that Bourdain swears a whole lot, eats as much weird flesh as he can, and wears a leather jacket as often as possible. His much younger, Italian second wife, who has a prodigious appetite of her own, is a competitive mixed martial arts fighter. He likes unfussy peasant cuisines, the Ramones, foie gras, Ferran Adria and telling you about how likes them; he hates Paula Deen and formality and LOVES telling you how he hates them. Whether any of the above particularly interests you or not is almost beside the point: it's Bourdain himself who is the main attraction. The success of No Reservations has less to do with the plot (middle-aged dude eats food in locales near and far; scored by mannered voiceover and late-boomer musical preoccupations) and everything to do with his considerable personal and verbal magnetism. But that he’s risen to such heights of fame is partly because Bourdain has managed to bend the definition of foodie to his own: not only has he spawned a legion of imitators in the food writing world (Halpern says, wearily, that every food memoir proposal that crosses his desk promises to be the next Kitchen Confidential), but Bourdain’s truly changed food culture. GQ writer Alan Richman, a longtime champion of a more white-table-clothed dining room, whom Bourdain labeled a “douchebag” –and worse—in a whole devoted chapter of his book, says of their very public tussle, “I thought that the world would be on my side. It was a 19th century man against a 21st century man … He has captured the gestalt and morality of modern America." The ascendancy of offal and bacon and low-key ethnic food and casual-but-adventurous dining and chefs who love to brag what food they eat when drunk was already well on its way in restaurateur circles before Bourdain hit bookshelves and TV sets (not trying to snub you here, Mr. Trillin! ), but he’s managed to make viewers at home want to eat that way, too. Bourdain also convinced more than a few readers that they might, as a career, want to be that line chef, and to set about doing it in a certain food punk way that, alongside locavorism, has been one of the most influential restaurant movements of recent years. See, perhaps: Eddie Huang's chef-on-chef verbal violence, and its preoccupation with authenticity —but also some truly meaningful culinary changes. Sytsma goes so far as to draw a direct line between Bourdain’s ascendance and that first of David Chang of the “cereal milk”-serving Momofuku empire and now of Danny Bowien of free-keg- beer-serving Mission Chinese—both of whom draw much of their buzz from allowing, quite literally, no reservations. There’s a scene in No Reservations: Ireland when a chef who’s offered up a meal at the altar of Bourdain wonders exactly how much blarney is involved in the making of the show. “Do you call it how it is, Tony, or do you just say everything’s lovely?” asks Belfast's Paul Rankin. “I call it how it is,” Bourdain replies, enthusiastically sampling the sort of semi-precious fusion food (oyster-chicken wontons in lobster jus with tomatoes and spinach, Irish lamb with potatoes and kimchi) he has been skeptical of elsewhere, when served up by those less committed to bringing fresh culture to a hidebound food scene than Rankin is. “So I get to chuck you out if you say too many good things,” Rankin replies. “That would be good television,” Bourdain replies without missing a beat. He says he likes the food—but it doesn’t matter so much; Rankin served up exactly the kind of moment Bourdain loves. Some performers get applause when the curtain comes down; Bourdain gets his when the curtain’s drawn back.